Grab your kicks and join us for a gallery hop and mural walk! For February’s GMD Los Angeles Tour, we’re heading to visit two-to-three galleries and walk through some of the Instagramable murals in the DTLA Arts District. We will begin by meet in front of Art Share LA and proceed to walk towards the DTLA Arts District most iconic murals and stop at The Container Yard and Institute of Contemporary Art, Los Angeles. We will be walking about 2.5 miles. We highly recommend that you come with a water bottle and good walking shoes. This month’s special guest is Mexican Center for Culture and Cinematic Arts at the General Consulate of Mexico in Los Angeles' Coordinator, Alina Escarcega. Everyones who attendees will receive an official GMD button! This month's tour requires a pay admission fee of $12. Register via Eventbrite. Please note that all sales are final, there will be no refunds. Sorry gurls. Alina Escarcega is a cultural manager and museographer focused on the promotion and dissemination of the arts in Mexico and the United States. She is also a Coordinator of the Mexican Center for Culture and Cinematic Arts at the General Consulate of Mexico in Los Angeles. We’ll meet at the front entrance of the Art Share LA. Find GMD’s founder Diane Lindquist waiting to meet y'all. There you will briefly introduce yourself, describe what you are passionate about, and your current art obsession before we proceed to our gallery hop and mural walk. We will quickly hop into the Art Share LA to see their recent exhibition titled ‘Reality Sandwiches’ and as well as checking out their newest exterior mural by MIKAEL B. (which decorates Art Share LA’s building). The show is inspired by a collection of Allen Ginsberg’s poems of that same title. Ginsberg conceived of reality sandwiches as scribbled secret notebooks and wild typewritten pages for your own joy. In that light, and tying it in with the overall conference theme of Art Speaks! Lend Your Voice, we invite artists to depict their current reality, their view of the current state of reality or where they wish for their reality to be. This is the moment we’ll hit Instagram mode and take those perfect insta shots and selfies with epic murals! GMD Founder is an expert Instagram, feel free to ask her to take a picture! We will walk toward The Container Yard (which building is covered with murals) and lastly head toward Institute of Contemporary Art, Los Angeles (ICA LA). At the ICA LA we see Sarah Cain mural titled 'Now I’m going to tell you everything’. While making our way there you betcha we will be spotting murals along the way. We will be walking about 2.5 miles. 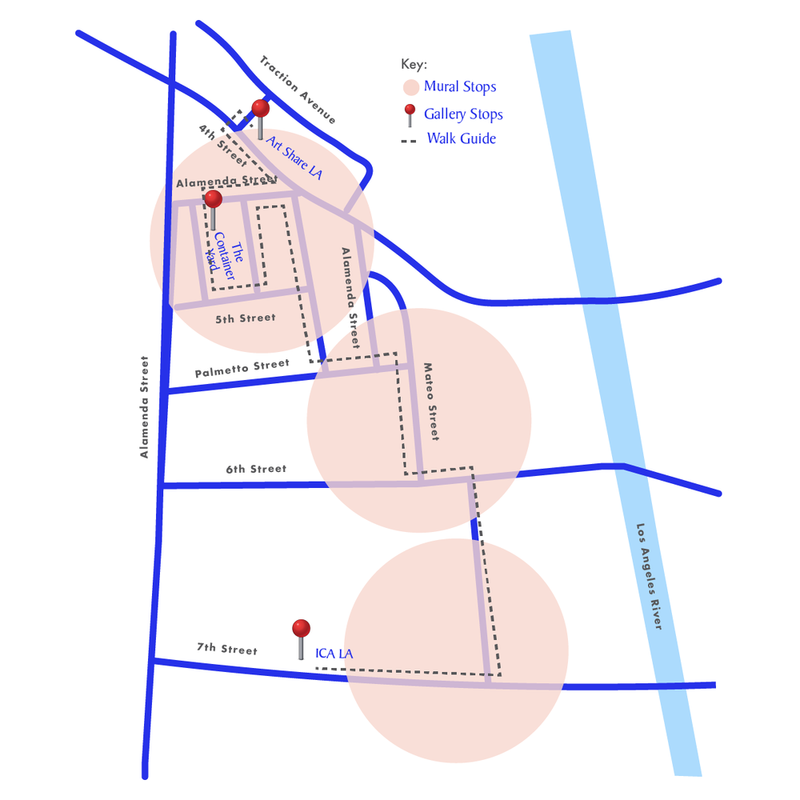 Please see the attached map as a reference to the gallery hop + mural walk. We highly recommend that you come with a water bottle and good walking shoes. Everyones who attendees will receive an official GMD button! #GURLMusuemDay, official hashtag. Spanning 800 square feet, this new work takes its title from a poem written for the artist by celebrated poet Bernadette Mayer. Cain’s abstract paintings often flirt with installation, unfolding across walls and floors, uncontained by the frame of the canvas. Recent work incorporates furniture, textiles, jewelry, and found objects as a way to break up the experience of painting as a two-dimensional form. Her vivid, playful patchwork of lines and shapes resist simple definition, recalling styles as diverse as abstract expressionism, graffiti, Pop, and Feminist craft. At this time we will briefly have announcements of upcoming gatherings and you will have the option to visit the other exhibition at ICA LA.